The closest supernova of its kind to be observed in the last few decades has sparked a global observing campaign involving legions of instruments on the ground and in space, including NASA's Spitzer Space Telescope. This image shows Spitzer's view of the supernova's host galaxy, M82 or the "Cigar galaxy," on three separate dates: May 9, 2005; February 7, 2014; and February 12, 2014. The observations from February 7 reveal the presence of a bright spot -- the supernova -- not present in the prior observations. By February 12, the supernova has started to dim somewhat from its peak brightness in the first week of February. 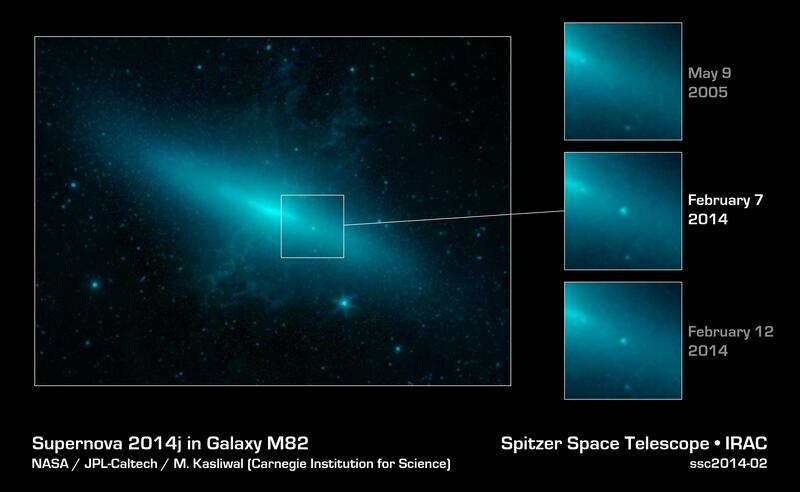 The supernova, dubbed SN 2014J, was first spotted by human observers on January 21, 2014. 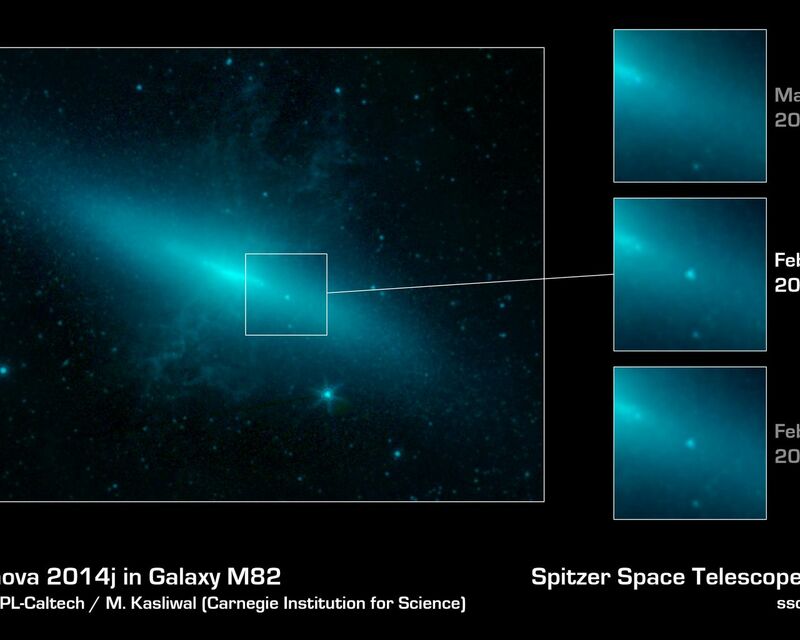 SN 2014J is glowing very brightly in the infrared light that Spitzer sees. The telescope was able to observe the supernova before and after it reached its peak brightness. Such early observations with an infrared telescope have only been obtained for a few Type Ia supernovas in the past. Dust in the M82 galaxy partially obscures observations in optical and high-energy forms of light. The infrared light that Spitzer sees in, however, can pass through this dust, allowing astronomers to peer directly into the heart of the aftermath of the stellar explosion. Researchers are currently using the data to learn more about how these explosions occur.